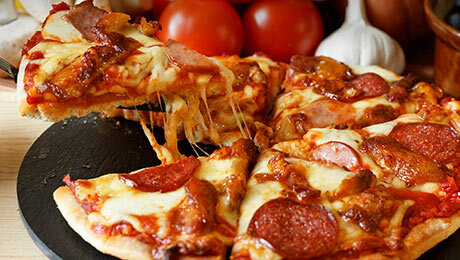 Designed to tear and share, a perfect pizza to share with family and friends. If under time constraints use a shop bought pizza base. Mix the dough thoroughly and then move it out onto a floured surface and kneed it for 4-5 minutes or until smooth and elastic. Transfer to an oiled bowl and cover with clingfilm. Leave it to rise for about 30-40 minutes or until the dough has doubled in size. Roll the pizza dough on a lightly floured surface and place on a 22 x 35cm lightly oiled baking tray. Top with some tomato sauce, chicken fillet, peppers, onions and oregano. Place in a preheated oven for 20 minutes until the cheese has melted and the pizza base is crisp. Sprinkle some Rocket and Spinach leaves on top and drizzle with a little olive oil.